"I understand you have worked so hard during this period. Now we don't have much time with us. Our dream must be the same as that of Heavenly Parent and True Parents. I as an individual, my family, my neighbors, tribe, race, and nation must become the ones that make the dream come true. We feel the urgency but there are still many environments that we need to establish. The dream that True Parents want to realize is very big. That is the ideal nation and the world which Heavenly Parent and we humankind as a family need to accomplish with true love. True Father, in order to realize that dream, had cultivated the front line of the providence day and night for 60 years. God's providence and history have been more than 6,000 years. Due to the failure of Adam and Eve, God's providential history took more than 6,000 years. The regretful, lonely and sad situation of Heavenly Parent could create the environment for the Messiah of the Second Coming after 6,000 years, which is the consolation to Heavenly Parent. When I think of the 60th anniversary of the end of the Korean War, I feel Heaven's anxiety which has been earnestly waiting for this time without wasting even a second. Heavenly Parent and True Parents, who have been worried in case any responsible person gives up, have been through the pain and suffering that is beyond the imagination. You, who are sitting here during your earthly life as the Blessed families, have been with the church for more than 20, 30 and even 40 years. But before the love and blessing you have received from Heaven and True Parents, we have been so insignificant and lacking. Do you agree? What did you feel when seeing two video clips? Can you do your best as a peace army and peace police with your 100%, 120%, 200% effort, loyalty and love in making this nation Korea as God's fatherland, standing out proudly in front of the world, which is the hope of God and all humankind by 2020? Can you promise to do it? I trust you. 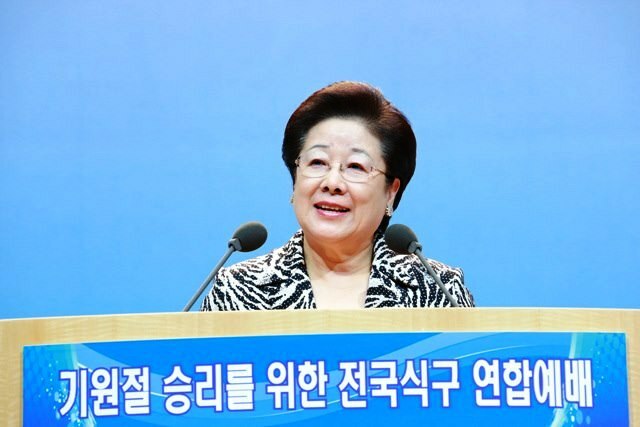 Wishing that you participate in the proud march file, create a better foundation, and make Korea as the nation where all humankind attends Heavenly Parent and True Parents in glory, I ask you to do your very best."